The Town of Bourne is a medium-sized rural community at the gateway to Cape Cod. The Cape Cod Canal bisects the community, with both the Bourne and Sagamore bridges, and the lift railroad bridge all located in Bourne. The canal is well known for its superb sport fishing, and for carrying ships flying the flags of all nations. The Bourne Scenic Park campground is located beneath the Bourne Bridge and is a perfect vacation location for those seeking to enjoy the activity and ever-changing vista of the canal. Bourne has numerous quiet harbors and inlets for boating and bathing, and the shellfishing in the area is particularly enticing. Bourne is a quiet community without the summer tourist crush experienced by some of the other Cape communities. The annual Bourne Scallop Festival, which is held in early September, brings visitors from across the nation each year. 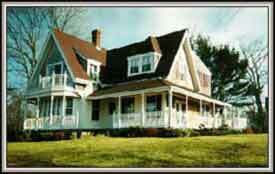 Because Holly House is only one mile from Bourne Bridge, it rests near many of the spectacular Cape Cod attractions. The Canal Road, only a quick stroll from the Inn, is wonderful for hiking, biking, or in-line skating. Historic Sandwich Village and Heritage Plantation offer a rich legacy and are located only a matter of minutes from Holly House. The coastal scene presents its sandy beaches, adventuresome walking trails, winding biking paths, and pristine golf courses, all packaged in a postcard-perfect setting. Ferries to Martha's Vineyard and Nantucket are nearby, and Route 6A, complete with its hidden antique markets and gift shops, always welcomes a new face.